According to Liverpool boss Jurgen Klopp, 'astonishing' Leicester City star Jamie Vardy is the current Premier League 'Player of the season', so it comes as no surprise to see Vardy linked once again with a move to Anfield. "Liverpool and Tottenham are keeping a close eye on Leicester City's in-form striker Jamie Vardy, sources have told ESPN FC". * Liverpool are 'leading the race' to sign Vardy, and the Reds are considering a £25m bid for the prolific striker. * A source 'close to the situation' has also allegedly told the Daily Star: “All the big clubs are looking at him [Vardy], but Liverpool [are] favourites. 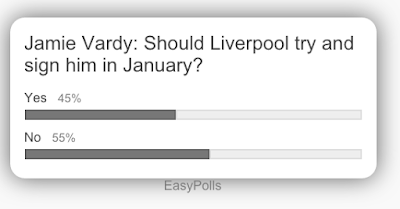 Vardy is the right fit for Liverpool. He would suit their high-intensity game under Klopp". Right now, Liverpool are 12-1 second-favourites to sign Vardy during the January transfer window, but despite his prodigious goal record this season, Liverpool fans don't seem that enamoured by the striker. Vardy is the Premier League's joint top goalscorer, so it's a rather surprising result, though it remains to be see if Vardy can maintain his form across a whole season, or consistently over 2-3 seasons. One thing's for sure: Vardy is making a mockery of Liverpool's attacking players. How? He has the same number of league goals this season (15) as Benteke, Lallana, Coutinho, Firmino, Can, Henderson, Ibe and Firmino *combined*. Combined! This is utterly indefensible. As for signing Vardy. If it's for any more than £12m-£15m max, then forget it. Liverpool have wasted far too much money on overpriced British one-season wonders, and although Vardy is quality (this season), there's now guarantee that he can replicate that form at Anfield.